Context: Due to increase in the number of patients with impaired immunity, the incidence of liver cancer has increased considerably. Aims: The aim of this study is the investigation the in vitro anticancer effect of zerumbone (ZER) on hepatocellular carcinoma (HCC). 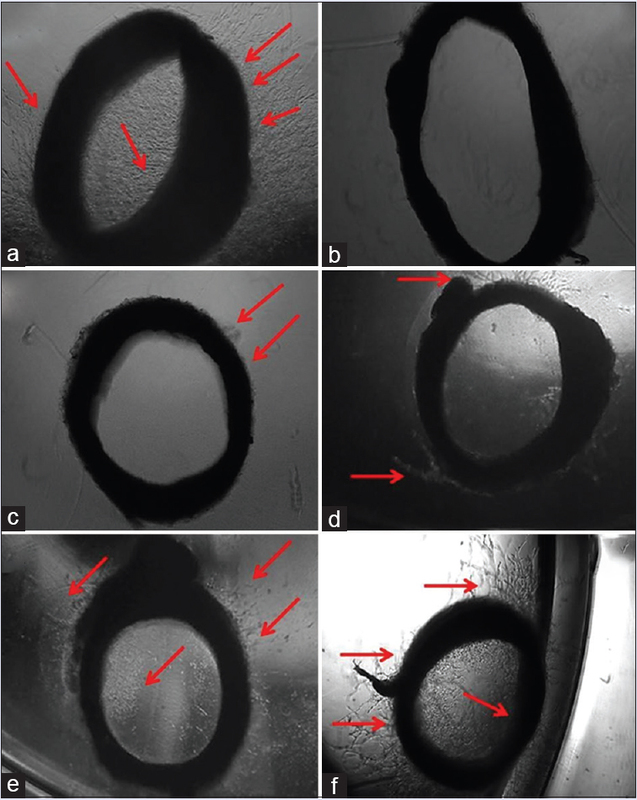 Materials and Methods: The anticancer mechanism of ZER was determined by the rat aortic ring, human umbilical vein endothelial cells (HUVECs) proliferation, chorioallantoic membrane, cell migration, and proliferation inhibition assays. Results: Our results showed that ZER reduced tube formation by HUVECs effectively inhibits new blood vessel and tissue matrix formation. Western blot analysis revealed that ZER significantly (P < 0.05) decreased expression of molecular effectors of angiogenesis, the matrix metalloproteinase-9, vascular endothelial growth factor (VEGF), and VEGF receptor proteins. We found that ZER inhibited the proliferation and suppressed migration of HepG2 cell in dose-dependent manner. Statistical Analysis Used: Statistical analyses were performed according to the Statistical Package for Social Science (SPSS) version 17.0. The data were expressed as the mean ± standard deviation and analyzed using a one-way analysis of variance. A P < 0.05 was considered statistically significant. Conclusion: The study for the first time showed that ZER is an inhibitor angiogenesis, tumor growth, and spread, which is suggested to be the mechanisms for its anti-HCC effect. Abbreviations used: ZER: Zerumbone, MMP-9: Matrix metalloproteinase-9, VEGF: Vascular endothelial growth factor, VEGFR: Vascular endothelial growth factor receptor, HUVECs: Human umbilical vein endothelial cells, HCC: Hepatocellular carcinoma, HIFCS: Heat inactivated fetal calf serum, DMSO: Dimethyl sulfoxide, EDTA: Ethyldiaminetetraacetic acid, Ig: Immunoglobulin, CAM: Chorioallantoic membrane, HRP: Horseradish peroxidase, NIH: National Institutes of Health, MTT: Microtetrazolium, SPSS: Statistical Package for Social Science. Objective: The prime objective of this study is to evaluate the cerebroprotective actions of Triticum aestivum (wheatgrass) powder and Bauhinia purpurea flower (dev kanchan) powder against the experimentally induced global ischemia reperfusion injury in rats. Materials and Methods: In the first phase of the studies, 1 h before the surgical procedure, the Wistar rats were orally served with varied doses of wheatgrass powder (5, 10, 30, and 100 μg/kg) and Bauhinia flower powder (30, 100, 200, and 300 μg/kg), respectively. The ischemia was induced by 30-min bilateral carotid artery occlusion in succession to reperfusion for 4 h. It was proved that the wheatgrass powder and Bauhinia flower powder yielded a significant, dose-dependent cerebroprotection in terms of reduction in cerebral infarct size when compared with the control group. Coming to the second phase of the studies, a certain potential dose of 10 μg/kg of wheatgrass and 200 μg/kg of Bauhinia flower powders was selected keeping the protective action in view, and the animals were treated for 15 days. Results: The major findings of the study are that wheatgrass and Bauhinia flower powders significantly augmented the magnitude of the antioxidant enzymes, viz., super oxide dismutase and catalase, and further reduced the levels of lipid peroxidation. 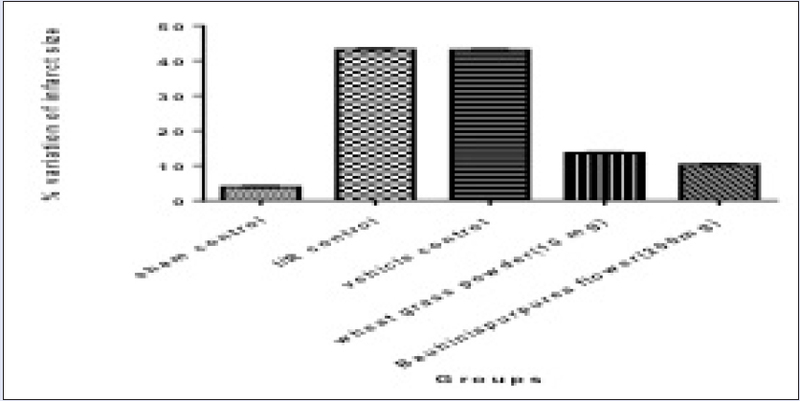 Conclusions: The present study clearly showed that the wheatgrass powder and Bauhinia flower powder possess significant antioxidant properties that may act as a key ingredient in various ayurvedic preparations for the treatment of various diseases like cerebral ischemic reperfusion injury. Abbreviations used: BCAO: Bilateral Carotid Artery Occlusion, MCA: middle cerebral artery, ROS: reactive oxygen species, SCMC: Sodium carboxy methyl cellulose, p.o: Per oral route, T.T.C: Triphenyl tetrazolium chloride, MDA: Malondialdehyde, SOD: Super oxide dismutase. Background: In experimental therapy of cancer, survivin is considered to be one of the well-established targets. Studies have found that it is overexpression in most of the human tumors, but it is rarely found in normal tissues. It is having varied structural and functional role. It controls cell division and cellular stress response and also regulates metastasis and migration of cancerous cells. It has also been recognized as a biomarker which makes it unconventional drug target. In spite of being one of the centrally active components in metastasis and invasion, their clinical use is minimal. To increase the therapeutic efficiency of cancer and its various stages, it is important to survey novel reagents targeting the pathways and mechanism involving survivin. Objective: The aim of this study was to identify novel survivin inhibitor candidates using in silico screening. Materials and Methods: In this course of work, virtual screening on a dataset of natural compounds retrieved from ZINC and other libraries were performed. Comparative analysis of the protein was done by studying the binding affinity of inhibitors that are already available. The best interacting complex was set for molecular dynamics simulation for 25 ns to validate the stability of system. 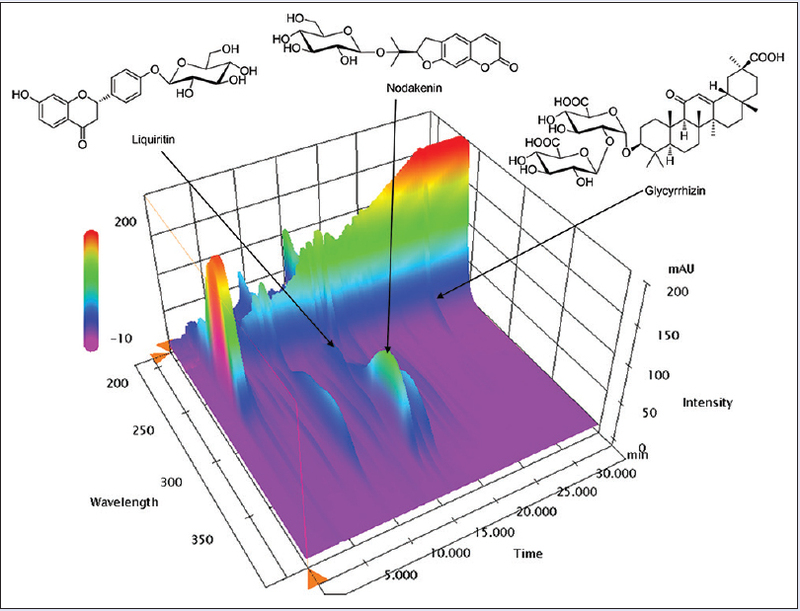 These molecules were checked for their toxicity and absorption, distribution, metabolism, excretion, and toxicity (ADMET) properties using OSIRIS and pre-ADMET tools. Results: We discovered ten such candidates with better binding efficiency with survivin in comparison to marketed chemical against the same. Furthermore, these inhibitor candidates did not induce cell toxicity. Binding affinity of reference molecules was varied from −6.8 to −8.5 kcal/mol while that of top scoring compound ZINC00689728 is −9.3 kcal/mol binding energy. Good placement and strong bond formation of selected molecule was observed during course of work. It is also having permissible ADMET property. Conclusion: Considering all the parameters, the screened molecule can be considered as a potential lead compound for designing new drug against survivin. Further investigation and testing will be required to make it to the final stage. Abbreviations used: MD: Molecular dynamics, LogS: Aqueous solubility, Acceptor HB: Hydrogen bond acceptor, Donor HB: Donor hydrogen bond donor, ADMET: Absorption, distribution, metabolism, excretion, and toxicity, RCSB: Research Collaboratory for Structural Bioinformatics, OPLS: Optimized potentials for liquid simulations, RMSD: Root-mean-square deviation. Background: Breast cancer (BC), because of its invasive characteristics, is one of the most common and deadliest cancers among the female population around the world. Research has demonstrated that AhR signaling also plays a vital role in BC initiation and development as well. Therefore, blocking this pathway to natural interferences paves a new channel for the prevention of BC. Several natural compounds such as flavonoids possess the anticancer activities against different cancers. Objective: The present study has been designed to estimate the chemotherapeutic potential of taxifolin (TAX) against 7,12-dimethylbenz(a)anthracene (DMBA)-induced mammary carcinoma in Sprague-Dawley rats. 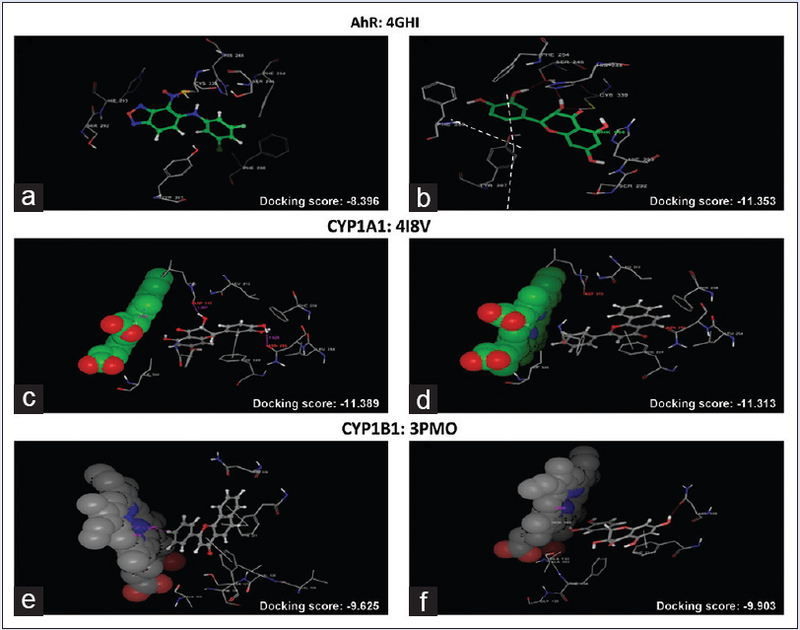 Materials and Methods: Initially, the molecular docking analysis of AhR and cytochrome P450s (CYPs) (CYP1A1 and CYP1B1) was performed using MAESTRO tool, in an attempt to rationalize the activity of TAX, based on their CYP1-binding potential. The in vitro CYP1A1 activity was determined by luciferase assay with CYP1A1 substrate luciferin CEE. The in vivo analysis was performed by administrating TAX at 10, 20, 40 mg/kg BW for 28 days intragastrically in DMBA induced (25 mg/animal dose) at 55 days of age Sprague-Dawley (SD) rats. BC initiates after 90 days of tumor induction phase. The molecular mechanism of TAX on Ahr and CYPs was also examined through the mRNA and protein expressions using reverse transcription-quantitative polymerase chain reaction and Western blotting analysis. Results: Furthermore, TAX altered the energy regulation on DMBA-induced BC in SD rats by considerably restoring the cancer-induced modulations in tumor growth. 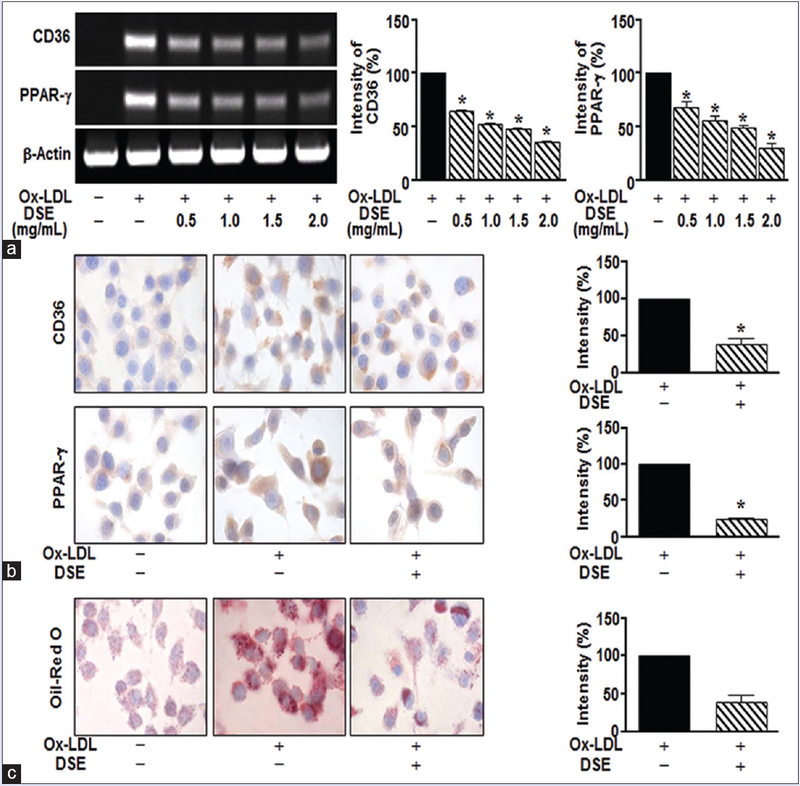 Our results showed that TAX reduced the expressions of CYP1A1 and CYP1B1 in DMBA-induced mammary carcinoma by downregulating the AhR signaling pathway. Conclusion: This study revealed that TAX might be able to act as a chemotherapeutic agent against CYP1A1- and CYP1B1-mediated cancer and the inhibition of the DMBA-induced mammary carcinogenesis in a rat model. Abbreviations used: CYPs: Cytochrome P450s; PAH: polycyclic aromatic hydrocarbons; HRP- Horseradish peroxidase; BSA: Bovine serum albumin; DTTP: Deoxythymidine Triphosphate (nucleotide); RT-qPCR: Real Time quantitative polymerase chain reaction; CADD: Computer Aided Drug Drafting. Background: Ficus hispida Linn. (Family Moraceae), well-known beneficial medicinal shrub, has been traditionally used for the treatment of various diseases such as leukoderma. Objective: The aim of the present study is to investigate the efficacy of F. hispida ethanolic leaves extract for antiproliferative, apoptotic, cell cycle blockade, and wound healing. 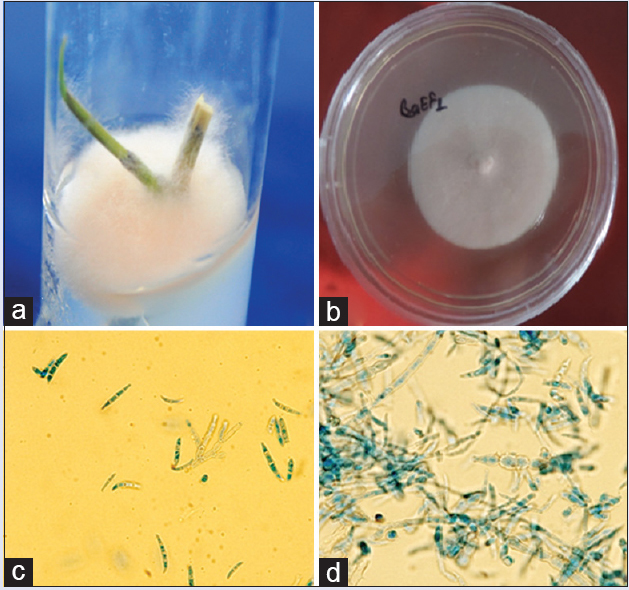 Materials and Methods: F. hispida leaves extract was treated with colorectal adenocarcinoma cancer cell line HT29 for 24 h with control. The cells were treated at varying concentration ranges of 15, 31, 62, 125, and 250 μg/ml each The cytotoxicity effect of leaves extract was studied by 3-[4, 5-dimethylthiazol-2-yl]-2, 5 diphenyltetrazolium bromide assay and their anticancer activity was further evaluated using cell cycle analysis and wound scratch assay. 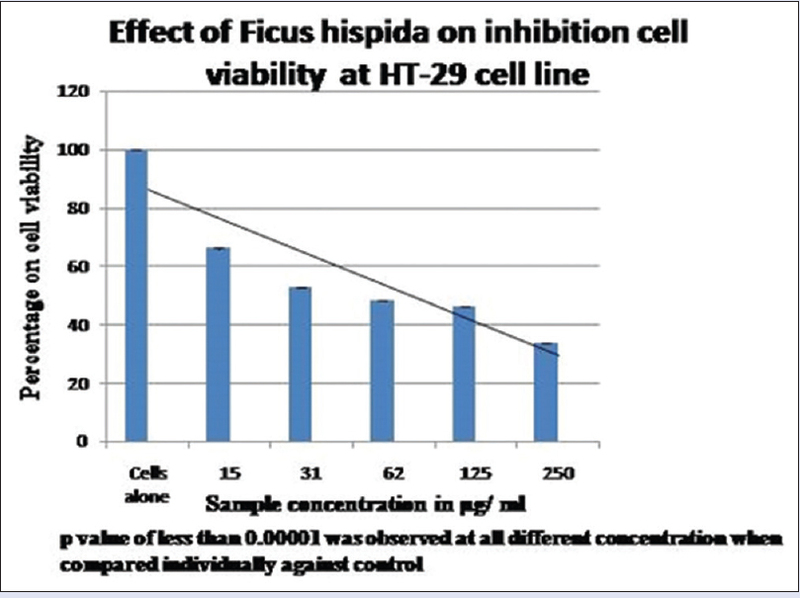 Results: The end antiproliferative result showed that HT-29 cell viability decreases in a concentration-dependent manner and the growth inhibitory effect (IC50) values are obtained at a concentration of 125 μg. The increase in number of apoptotic cell was observed after treating HT-29 cells with the sample in double-staining methods. G0/G1 phase of the cell cycle was significantly blocked by the test sample followed by the G2/M phase in a negligible manner. In vitro cell wound closure or contracture was not significant when compared the sample against control group. Conclusion: F. hispida Linn. ethanolic leaves extract had shown to possess excellent cytotoxic effect through inducing apoptosis, especially causing cell cycle arrest at the G0/G1 phase. Abbreviations used: HT 29: Human adenocarcinoma colorectal cell line; PBS: Phosphate Buffered Saline; FBS: Fetal Bovine Serum; DMEM: Dulbecco's Modified Eagles Medium; MTT: 3 [4, 5 dimethylthiazol 2 yl] 2, 5 diphenyltetrazolium bromide; NCCS: National Centre for Cell Sciences; DMSO: DiMethyl SulfOxide; PI: Propidium Iodide; AO: Acridine Orange;EB: Ethidium Bromide; IC: Inhibitory Concentration. Background: Meyna spinosa (M.S) (Roxb.) ex Link and Oroxylum indicum (O.I) (Linn.) Vent, widely used traditional Northeast Indian medicinal plant used for various purposes, have not yet explored for safety profile. Objective: To investigate the safety profile of M.S (Roxb.) ex Link leaves and O.I (Linn.) Vent stem bark extracts collected from Northeast region of India. Materials and Methods: In this study, mutagenic, cytotoxic, and genotoxic and/or nontoxic potential of these two plant extracts using various toxicological investigations, as per the regulatory test guidelines, were evaluated. The mutagenic, cytotoxic, and genotoxic potential of these two plants were assayed using Ames test, 3-(4,5-dimethylthiazol-2-yl)-2,5-diphenyltetrazolium bromide assay, comet assay, and micronucleus test in the bone marrow cells. Results: The results demonstrated that the tested doses of M.S (Roxb.) ex Link leaves extract showed mutagenic, cytotoxic, and genotoxic effects, whereas O.I (Linn.) Vent stem bark extracts showed nonmutagenic, noncytotoxic, and nongenotoxic effects. Conclusion: The stem bark extracts of O.I (Linn.) Vent has no mutagenic, cytotoxic, and genotoxic or clastogenic effects in our experimental conditions. However, M.S (Roxb.) ex Link leaves extract caused a significant increase in DNA damage as compared with the positive control, i.e., cyclophosphamide. Thus, the present study revealed that M.S (Roxb.) ex Link leaves extract is toxic, while O.I (Linn.) Vent stem bark extract was found to be safe. Abbreviations used: MS: Meyna spinosa; OI: Oroxylum indicum. Background: Tea (Camellia sinensis) being the most widely drank beverage and despite having numerous beneficial role toward health and disease, its safety evaluation during pregnancy and prenatal, postnatal developmental period need to be monitored. Objective: This study was to evaluate the toxicity of black tea extract (BTE) in experimental pregnant rats and on their pups during prenatal and postnatal developmental periods. Materials and Methods: Pregnant female (120 ± 10 g) Wister albino rats were chosen for this study. Group 1 was control group where pregnant female rats were treated with saline. Group 2 and Group 3 were pregnant female rats treated with 50 mg and 100 mg BTE/kg/day, respectively, throughout prenatal and postnatal periods. All three groups of rats were provided food and drinking water ad libitum. Animals were examined through their urinary and serum parameters, histopathological studies, and biomorphometric studies in pups. All data were expressed as mean ± standard deviation with significance between the controls and the treated groups (n = 6). Collected data were subjected to the analysis of variance and Tukey test; P < 0.05 was considered as statistically significant. Results: BTE produced significant alterations in urinary calcium, creatinine, and urea during prenatal period; exhibited proteinuria, ketonuria, and histology showed nephrotoxicity during postnatal period, and BTE also showed a significant increase in serum proinflammatory cytokines and decreased anti-inflammatory cytokines level compared to control group. BTE caused significant changes in biomorphometric parameters in the pups as compared with pups of control mothers. Conclusion: This study confirmed the BTE-induced toxicity in pregnant rats and their pups. Abbreviations used: BTE: Black tea extract, IL-1α: Interleukin 1 alpha, IL-1 β: Interleukin 1 beta, IL-6: Interleukin 6, IL-10: Interleukin 10, TNF-α: Tumor necrosis factor alpha. Background: To date, efforts for the prevention and treatment of human respiratory syncytial virus (RSV) infection have been still vain, and there is no safe and effective clinical accepted vaccine. Arisaema genus has claimed for various traditional bioactivities, but scientific assessments are quite limited. Objective: This encouraged us to carry out our present study on around 60 phytoconstituents of different Arisaema species as a natural inhibitor against the human RSV. 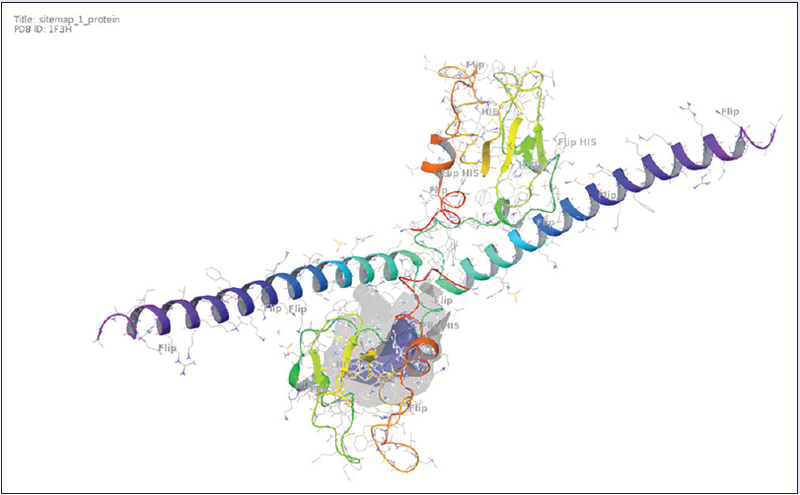 Materials and Methods: Selected 60 phytochemical entities were evaluated on the docking behavior of human RSV receptor (PDB: 4UCC) using Maestro 9.3 (Schrödinger, LLC, Cambridge, USA). Furthermore, kinetic properties and toxicity nature of top graded ligands were analyzed through QikProp and ProTox tools. Results: Notably, rutin (glide score: −8.49), schaftoside (glide score: −8.18) and apigenin-6,8-di-C-β-D-galactoside (glide score − 7.29) have resulted in hopeful natural lead hits with an ideal range of kinetic descriptors values. ProTox tool (oral rodent toxicity) has resulted in likely toxicity targets of apex-graded tested ligands. Conclusion: Finally, the whole efforts can be explored further as a model to confirm its anti-human RSV potential with wet laboratory experiments. Abbreviations used: RSV: Respiratory syncytial virus, PRRSV: Porcine respiratory and reproductive syndrome virus, ADME-T: Absorption, distribution, metabolism, excretion, and toxicity. Background: The antioxidant potential of medicinal plants has been illustrated through many reports clearly depicting that plants are a rich source of antioxidants, making them a great resource of novel drugs and health-care products. Objectives: The current study is, therefore, focused toward the assessment of antioxidant properties along with the presence of phytochemicals in leaves of 18 varieties/accessions of Aegle marmelos. Materials and Methods: The antioxidant activities were initially measured using superoxide radical scavenging method, 2, 2-diphenyl-1-picrylhydrazyl (DPPH), and ferric-reducing ability of plasma assays. 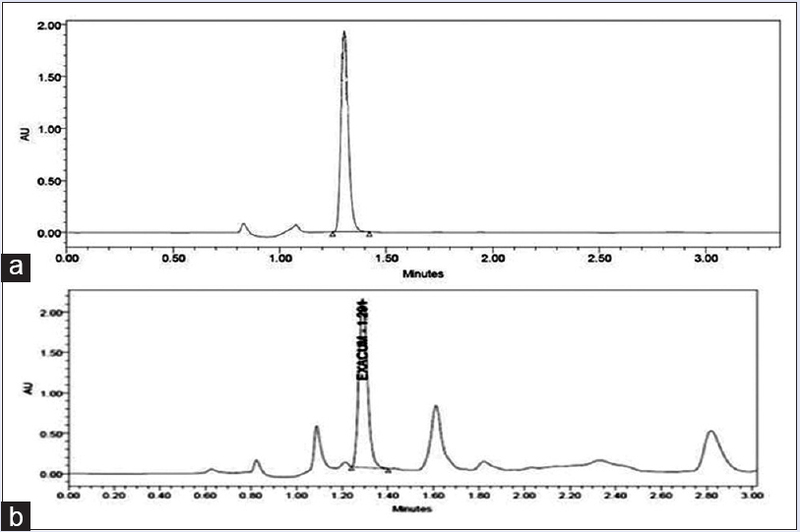 Further, thin-layer chromatography (TLC), high-performance TLC, and column chromatography were performed to isolate the potentially active fraction and anti-inflammatory activity of crude, and the isolated fraction was tested on J774 macrophage cell line. Results: The maximum inhibition of superoxide anions was shown by Pant Aparna. Additionally, Pant Aparna extract was most efficient, exhibiting 92.0% inhibition in scavenging the DPPH radicals. The content of total carotenoids was found to be higher in Pant Aparna among all the varieties/accessions. Furthermore, the crude extract and the fraction A. marmelos methanolic fraction 21 (AMMF21) were found to be nontoxic and significant reactive oxygen species, and NO inhibition was observed in a concentration-dependent manner. 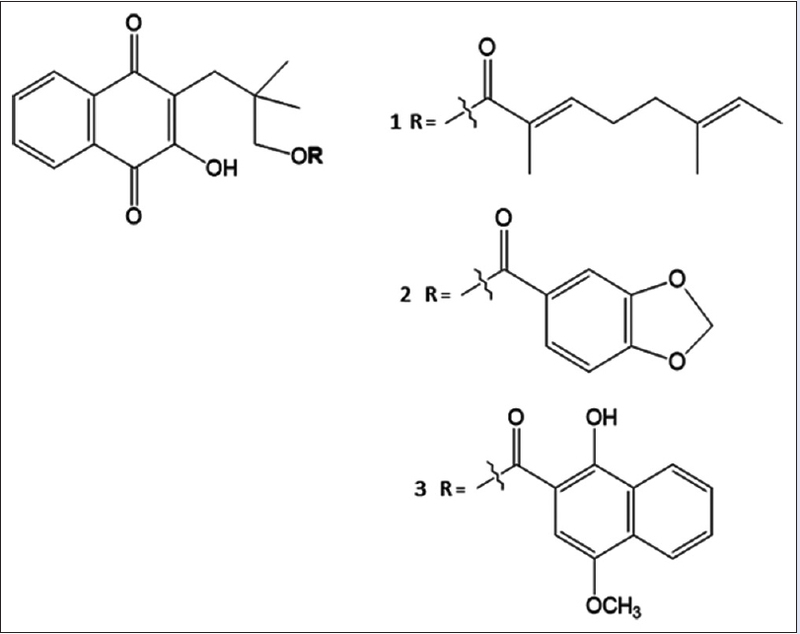 Moreover, the methanolic extract of variety Pant Aparna showed promising in vitro antioxidant activity, indicating its potency for therapeutic applications. Conclusion: In brief, this is the first ever report on Pant Aparna as the best variety in terms of phytocompounds and identification of potential antioxidant activity. In addition, the AMMF21 fraction of methanolic extract possessing best antioxidant activity on macrophage cells indicates its use as a novel phytotherapeutic agent. Abbreviations used: AMMF21: Aegle marmelos methanolic fraction 21, DPPH: (2, 2-diphenyl-1-picrylhydrazyl), FRAP: Ferric-reducing ability of plasma, HP-TLC: High-performance-thin-layer chromatography, TLC: Thin-layer chromatography, TCA: Trichloroacetic acid, TPTZ: 2,4,6-Tripyridyl-s-triazine, DNPH: 2,4-dinitrophenyl hydrazine, NBT: Nitroblue tetrazolium, NADH: Nicotinamide adenine dinucleotide, PMS: Phenazine metho-sulfate, DMEM: Dulbecco's modified Eagle medium; MTT: (3-(4,5-dimethythiazol-2-yl)-2,5-diphenyl tetrazolium bromide, DCFDA: 2',7'-dichlorofluorescein diacetate, LPS: Lipopolysaccharide, NED: N-(1-Naphthyl) ethylenediamine. Background: Withania somnifera is an Indian medicinal herb known for the multipotential ability to cure various therapeutic ailments as described in the ayurvedic system of medicine. 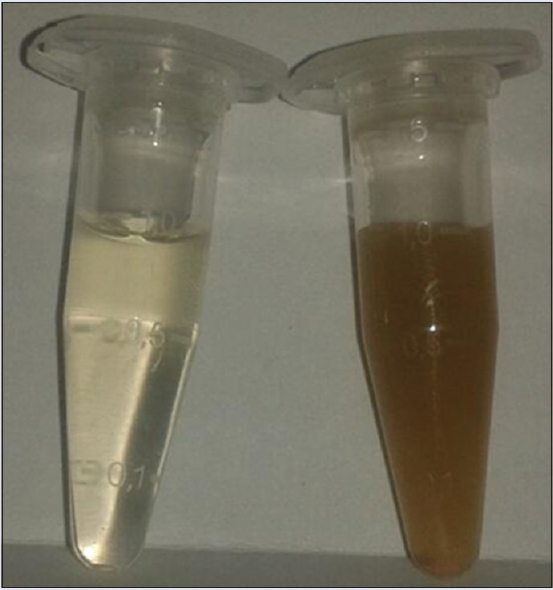 Objective: In the present study, we have evaluated the antiproliferative activity of a standardized W. somnifera root extract (Viwithan) against different human and murine cancer cell lines. Materials and Methods: The cytotoxicity of Viwithan was determined using thiazolyl blue tetrazolium blue assay and crystal violet staining. The apoptotic changes in B16F1 cells following treatment with Viwithan were observed by acridine orange/ethidium bromide (AO/EB) staining and DNA fragmentation assay. The binding affinity of withanolides in Viwithan with antiapoptotic proteins B-cell lymphoma 2, B-cell lymphoma-extra large, and myeloid cell leukemia 1 (MCL-1) were studied using in silico approach. Results: The half maximal inhibitory concentration (IC50) values of Viwithan against liver hepatocellular carcinoma, Henrietta Lacks cervical carcinoma cells, human colorectal carcinoma cell line, and Ehrlich ascites carcinoma cells were 1830, 968, 2715, and 633 μg/ml, respectively. Interestingly, Viwithan was highly effective against B16F1 cells with an IC50 value of 220 μg/ml after 24 h treatment. The morphological alterations of apoptotic cell death were clearly observed in the AO/EB-stained cells after treatment with Viwithan. Viwithan induced late apoptotic changes in treated B16F1 cells as evident by the ladder formation of fragmented DNA in a time-dependent manner. The findings of molecular docking showed that withanolides present in Viwithan have a more binding affinity with the antiapoptotic proteins, particularly MCL-1. Conclusion: We have reported for the first time that Viwithan with 5% withanolides has a potent cytotoxic effect, particularly against B16F1 murine melanoma cells among the different cancer cell lines tested. Abbreviations used: MTT: Thiazolyl blue tetrazolium blue; DMSO: Dimethyl sulfoxide; BSA: Bovine serum albumin; DMEM: Dulbecco's minimum essential medium; NCCS: National Centre for Cell Science; PBS: Phosphate-Buffered Saline; HepG2: Liver hepatocellular carcinoma; HeLa: Henrietta Lacks cervical carcinoma cells; HCT-116: Human colorectal carcinoma cell line; EAC: Ehrlich ascites carcinoma cells; IC50: Half maximal inhibitory concentration; AO/EB: Acridine orange/Ethidium bromide; BCL-2: B-cell lymphoma 2; BCL-XL: B-cell lymphoma-extra large; MCL-1: Myeloid cell leukemia 1; PDB: Protein Data Bank; ANOVA: Analysis of variance. Background: Exacum lawii (Gentianaceae), a bitter herb conventionally used in kidney diseases and eye problems, endemic to the Western coast and Southern part of India. Aim: Folklore reports encourage the author to explore the nephroprotective effect of the standardized ethanolic extract of E. lawii against cisplatin-induced renal toxicity in the rat to scientifically validate its traditional use. 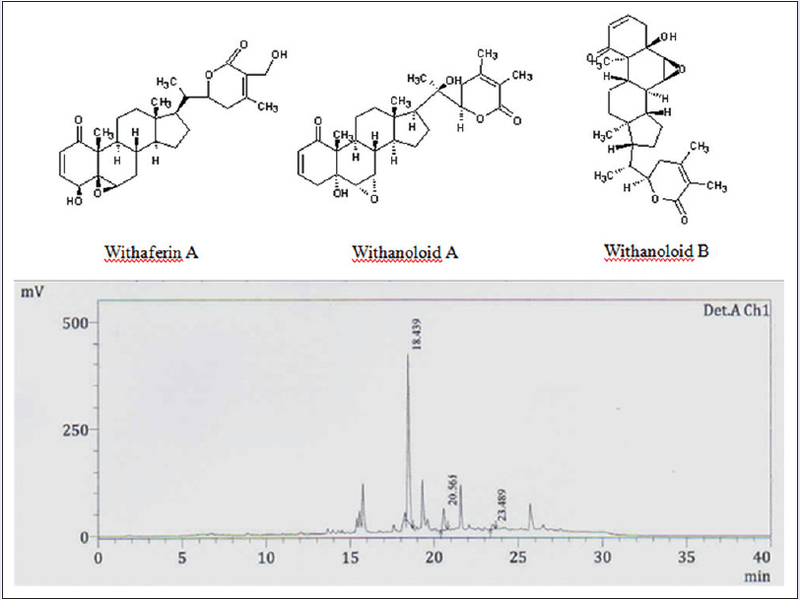 Materials and Methods: Ethanolic extract of the whole plant of E. lawii was standardized with swertiamarin (secoiridoid glycoside) using high-performance liquid chromatography and tested for subacute toxicity according to the OECD guidelines. Nephroprotective potential at different doses of extract was evaluated against cisplatin (6 mg/kg, intraperitoneal) in experimental rats. The changes in serum renal toxicity markers, renal tissue oxidative stress biomarkers, and proinflammatory cytokines level were measured. To estimate the change in oxidative status of renal tissues, DNA and single viable cells were isolated from treated rat kidney, DNA fragmentation assay and flow cytometric analysis of reactive oxygen species (ROS) were performed. Histopathology of renal tissues was also examined. Results: Swertiamerin was found to be 119.59 mg/g of extract. Administration of E. lawii extract (ELE) restored the biochemical parameters. It also decreases the elevated proinflammatory cytokines level in kidney tissues and protected rat kidneys from oxidative stress in rats. Nephroprotective activity was validated by estimating ROS production in kidney live cells and DNA damage in kidney tissue. The histological architecture was also conserved. Conclusion: ELE showed significant renal protection against cisplatin through reducing oxidative stress and inflammation. Abbreviations used: ELE: Exacum lawii ethanolic extract; WHO: World Health Organization; SOD: Superoxide dismutase; CAT: Catalase; MDA: Malondialdehyde; HPTLC: High performance thin layer chromatography; p.o. : Per oral; i.p. : Intraperitoneal; TNF-α: Tumor necrosis factor alpha; IL-1β: Interleukin 1 beta; IL-6: Interleukin 6; ROS: Reactive oxygen species. Background: Obesity is one of the imperative dynamics in the incidence and intensification of type 2 diabetes mellitus (T2DM). Rhinacanthus nasutus leaf extracts are previously reported for their antidiabetic and antiobesity potential. Objective: The present study was performed to evaluate glucose uptake stimulatory and antiadipogenic activities of a standardized rhinacanthins-rich extract (RRE) and its marker compounds namely rhinacanthin-C (RC), rhinacanthin-D (RD), and rhinacanthin-N (RN) in 3T3-L1 and L6 cells. Materials and Methods: RRE was prepared by a green extraction process, and the marker compounds (RC, RD, and RN) were isolated from the RRE using a silica gel column chromatography. Glucose uptake stimulation in both 3T3-L1 and L6 cells was performed by quantification of residual glucose in the media using glucose oxidase kit. Antiadipogenic activity in 3T3-L1 adipocytes was performed by intracellular lipids quantification using oil red O dye. Results: At the highest effective dose, RRE (20 μg/mL) exhibited satisfactory glucose uptake stimulatory effect in 3T3-L1 adipocytes that equivalent to RN (20 μg/mL) and the positive control insulin (0.58 μg/mL) but higher than RC (20 μg/mL) and RD (20 μg/mL). In addition, treatments of L6 myotubes showed that RRE (2.5 μg/mL) exhibited potent and equivalent glucose uptake stimulation (>80%) to RC (2.5 μg/mL) and the standard drugs, insulin (2.90 μg/mL) and metformin (219.5 μg/mL), but higher than RD (2.5 μg/mL) and RN (2.5 μg/mL). 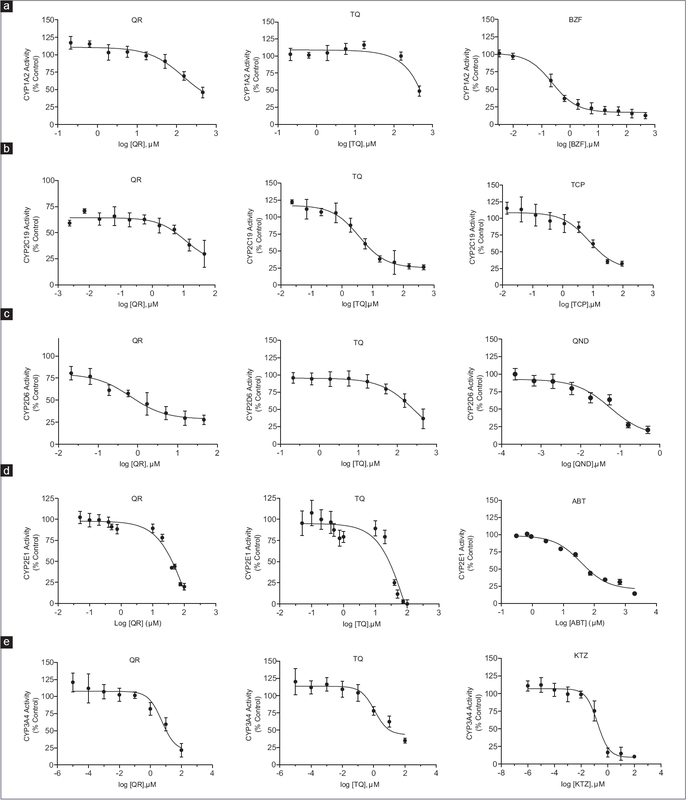 Furthermore, RRE (20 μg/mL) exhibited potent antiadipogenic effect in 3T3-L1 adipocytes, which equivalent to RC (20 μg/mL) but higher than RD (20 μg/mL) and RN (20 μg/mL). Conclusions: The undertaken study suggests that RRE could be used as an effective remedy in the treatment of obesity-associated T2DM. Abbreviations used: T2DM: Type-2 diabetes mellitus; RRE: Rhinacanthins-rich extract; RC: Rhinacanthin-C; RD: Rhinacanthin-D; RN: Rhinacanthin-N; α-MEM: α-Minimum essential medium; DMEM: Dulbecco's modified Eagle's medium; HS: Horse serum; FBS: Fetal bovine serum; BSA: Bovine serum albumin; IBMX: 3-isobutyl-1-methylxanthine; MTT: 3-(4,5-dimethylthiazol-2-yl)-2,5-diphenyltetrazolium bromide; GO: Glucose oxidase; NMR: Nuclear magnetic resonance; HPLC: High-performance liquid chromatography. Objective: The aim of this study was to investigate the possible herb-drug interactions between the traditional herbal formula Guibi-tang (GBT; Guipi-tang, Kihi-to) and conventional drugs. Materials and Methods: GBT was orally administered to either male or female Sprague Dawley (SD) rats once daily at doses of 1000, 2000, or 5000 mg/kg/day for 13 weeks. The messenger ribonucleic acid (mRNA) expression of drug-metabolizing enzyme cytochrome P450 isozymes (cytochrome P450s; CYP1A1, 1A2, 2B1/2, 2C11, 2E1, 3A1, 3A2, and 4A1) was analyzed in hepatic tissues by reverse transcription-polymerase chain reaction. Results: Repeated oral administration of GBT did not significantly influence the mRNA expression of hepatic CYP1A1, 1A2, 2B1/2, 2C11, 2E1, 3A1, 3A2, and 4A1 in male rats. By contrast, in female rats, the mRNA expression of hepatic CYP1A2 and 2B1/2 was significantly increased by repeated GBT treatment. Conclusion: Our findings indicate that caution is required in females when GBT is taken concomitantly with conventional drugs metabolized by CYP1A2 or 2B1/2. Our results provide information regarding the safety and effectiveness of GBT for clinical use. Abbreviations used: CYP450: Cytochrome P450s, GBT: Guibi-tang, SD: Sprague Dawley, HPLC: High-performance liquid chromatography, OECD: Organization for Economic Cooperation and Development, RNA: Ribonucleic acid, RT-PCR: Reverse transcription-polymerase chain reaction, GADPH: Glyceraldehyde-3-phosphate dehydrogenase. Background: Enterococcus faecalis (Ef) is a multidrug-resistant pathogenic bacteria associated with hospital-acquired infections. Ef is involved in a number of infectious diseases. It generally infects patients with the weekend immune system, i.e. a person mostly acquires Ef infections in the hospital, especially in intensive care units and thus, is more likely to be resistant to many antibiotics. Development of resistance against various antibiotics and emergence of drug-resistant strains is a growing global concern. Objective: Due to the unselective use of antibiotics for a long time multidrug resistant bacteria and extensively drug-resistant, which is now posing a new challenge to the medical community. To treat infections caused by Ef, the synergistic effect of different antibiotics with silver nanoparticles (AgNPs) was tested against Ef. 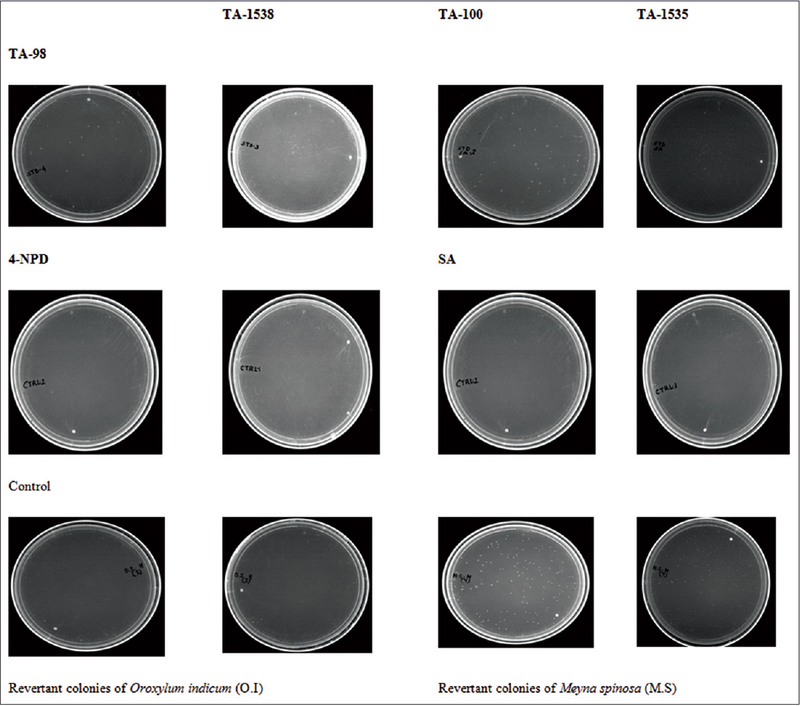 Materials and Methods: In the present study, synthesis of AgNPs was carried out from the cell-free supernatant of Klebsiella pneumoniae. AgNPs were characterized using various techniques, namely, ultraviolet-visible spectrophotometry, transmission electron microscopy, and Fourier transform infrared spectroscopy. Moreover, process optimization was done for enhanced production of AgNPs. In addition, antimicrobial activity of the nanoparticles was also tested. Furthermore, the nanoparticles were evaluated for their antimicrobial activities in combination with gentamicin and chloramphenicol, against Ef. Results: The results showed that the combination of gentamicin and chloramphenicol with AgNPs has a better antibacterial effect. To add to this, hemolytic activity of AgNPs was evaluated against human red blood corpuscles (RBCs). AgNPs were found to be nontoxic to RBCs. Conclusion: The collective effect of AgNps with Gentamicin and Chloramphenicol was more as compared to AgNps alone which indicate the synergistic effect of these components. These observations show the potential of AgNPs in combination with above-stated antibiotics against Ef infections. Abbreviations used: Ef: Enterococcus faecalis, MDR: Multidrug resistance, AgNPs: Silver nanoparticles, Kp: Klebsiella pneumoniae, RBCs: Red blood corpuscles, ENPs: Engineered nanoparticles, FTIR: Fourier transform infrared spectroscopy, TEM: Transmission electron microscopy, AgNO3: Silver nitrate, EDTA: Ethylenediaminetetraacetic acid, PBS: Phosphate-buffered saline. Background: Triphala, an Ayurvedic polyherbal formulation, is used for the treatment of various diseases including obesity. Objective: The present study was planned to evaluate the anti-adipogenic potential of aqueous extract of Triphala (TPaq) using 3T3-L1 adipocyte cell line model. Methods: The effect of aqueous extract of Triphala (TPaq) was tested on the viability of 3T3- L1 cells by MTT assay. The cells were treated with a cocktail of dexamethasone (DEX), isobutylmethylxanthine (IBMX) and insulin to induce adipogenesis. 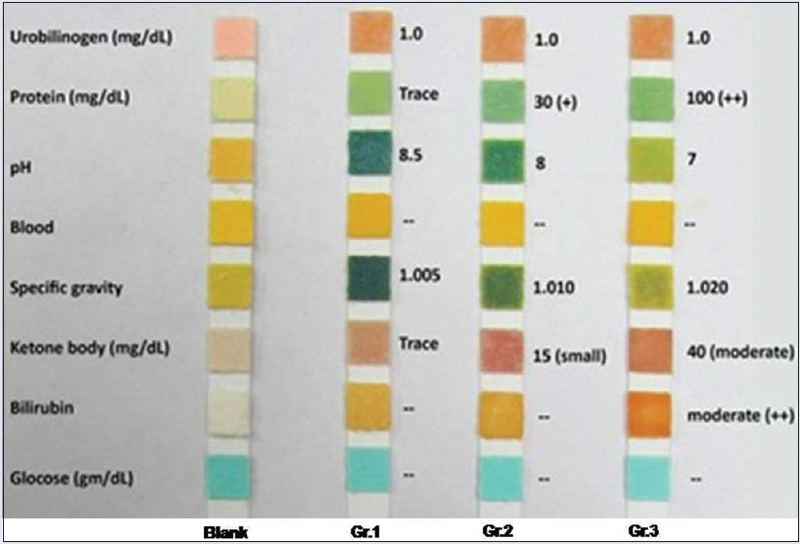 The cells were treated either with the induction cocktail or with the cocktail containing different concentrations (1, 10 and100 μg/ml) of TPaq. Intracellular lipid content was analyzed using Oil O Red stain and was quantified after extracting with isopropanol at 500 nm wavelength. The expression of early (PPAR-γ and C/EBP-α) and late (GLUT4 and FAS) phase adipogenic genes was studied by real time PCR. Results: TPaqdid not affect the viability of 3T3-L1 cell line. Interestingly, TPaqinduced a concentration dependant decrease in the intracellular lipid content and expression of both early and late phase adipogenic genes. This decrease was statistically significant compared to cells treated with only induction cocktail. Conclusion: These results suggested that Triphala regulated lipid accumulation by down regulating expression of adipogenic genes, resulting into prevention of adipogenesis. Abbreviations used: TPaq: Aqueous extract of Triphala; DMEM: Dulbecco's Modified Eagle's medium; FBS: Fetal Bovine Serum; IBMX: Isobutyl methylxanthine; DMX: Dexamethasone; MTT: [3-(4, 5-dimethylthiazol-2-yl)-2, 5-diphenyltetrazolium bromide] assay; PPARγ: Peroxisome proliferator-activated receptor; C/EBP:Enhancer binding protein α, FAS:Fatty acid synthase; Glut-4: Glucose phosphate transporter 4. Background: Puerarin (PUE) is a phytoestrogen found in Pueraria candollei and Pueraria lobata. These plants are substantial for traditional medicine in various Asian countries. PUE is a key marker that can be found only in the Pueraria species. Objective: To establish the method for determination of PUE content which is required for quality control of pharmaceutical products. Materials and Methods: PUE-cationized bovine serum albumin conjugate was created via Mannich reaction. After the rabbit immunization, the obtain anti-PUE polyclonal antibody (PAb) was used to develop an enzyme-linked immunosorbent assay (ELISA). Results: An anti-PUE PAb possess a great sensitivity and specificity. The cross-reactivity analysis shows no cross-reaction of an established antibody against other substances. 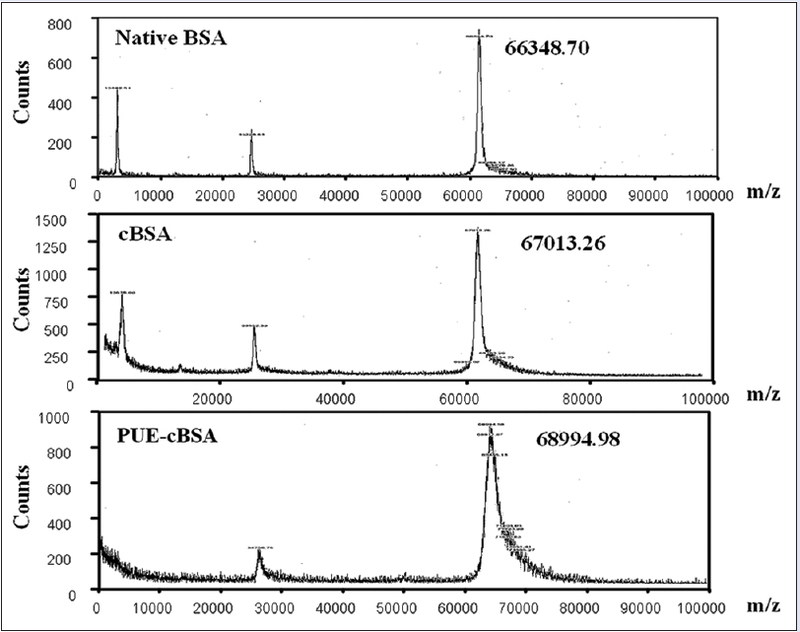 In addition, we successfully developed an indirect competitive ELISA (icELISA) for the quantitative analysis of PUE. The result of method validation conforms to acceptance criteria and correlates with high-performance liquid chromatography, the reference method. The icELISA was applied to determine PUE content in Pueraria spp. plant samples and its derived pharmaceutical products. Conclusion: This highly specific immunogen was created from the Mannich reaction. An icELISA can also be applied to other research propose in the further studies. Abbreviations used: PUE: Puerarin; PAb: Polyclonal antibody; ELISA: Enzyme-linked immunosorbent assay; icELISA: Indirect competitive ELISA; cBSA: Cationized bovine serum albumin. Objective: Prosopis farcta has been used as a traditional herbal medicine for treating Diabetes mellitus. The aim of this study is to investigate the antidiabetic mechanisms of infusion (INF) extract of P. farcta and discovering the active extract for the first time. Materials and Methods: Six different extracts of P. farcta were prepared using five different solvents (ethanol, n-hexane, acetone, ethanol:water (1:1 v/v), and water). Cytotoxicity and cell proliferation assays were performed on mouse pancreatic β-cells (β-TC3) using the 3-(4,5-dimethylthiazol-2-yl)-2,5-diphenyltetrazolium method. The effects of P. farcta on glucose metabolism (in a hepatocellular carcinoma cell line [HepG2]) and glucose diffusion across a dialysis membrane (as a model of cellular glucose absorption) were evaluated. The protective effect of various P. farcta extracts on cytotoxicity, mitochondrial membrane potential (MMP), and streptozotocin (STZ)-induced apoptosis in β-TC3 cells was investigated. Results: Cytotoxicity study indicated that extracts were safe on β-TC3and HepG2 (≤0.5 mg/ml). INF protected β-TC3 cells from apoptosis induced by STZ and improved cell viability for 20% and significantly decrease depolarization of MMP (P < 0.005). The results showed that INF inhabited breaking/streaking the DNA. Proliferation study showed no significant increase in the number of cells either at single or multiple doses. In moderate hyperglycemia (11.1 mmol/l), a significant glucose-lowering effect was observed but glucose diffusion was not the probable mechanism of extracts antidiabetic effect. In conclusion, only INF, the traditionally used extract, has an antidiabetic potential by attenuating the death and apoptosis induced by STZ in β-TC3 cells and increase glucose consumption. Conclusion: The present study demonstrates that only INF extract have an antidiabetic potential by attenuating the death and apoptosis induced by STZ in β-TC3 cells and increase glucose consumption. Abbreviations used: AC: Acetone extract; ANOVA: Analysis of variance; BSA: Bovine serum albumin; β-TC3: Mouse pancreatic β-cells; DMEM: Dulbecco modified Eagle medium; DMSO: Dimethyl sulfoxide; ETH: Ethyl acetate extract; FBS: Fetal bovine serum; HDETH: Hydroethanolic extract; HepG2: Hepatocellular carcinoma cell line; HEX: Hexane extract; INF: Infusion; KUMS: Kermanshah University of Medical Sciences; MMP: Mitochondrial membrane potential; MTT: 3-(4,5-dimethylthiazol-2-yl)-2,5-diphenyltetrazolium; NaCl: Natrium chloride; OD: Optical density; spp: Species; STZ: Streptozotocin; Tag: T-antigen; USA: United States of America. Background: Drugs for the treatment of liver diseases are scarce and not effective enough. Some species of the genus Cirsium possess hepatoprotective activity. There are no studies on the hepatoprotective effects of nonpolar extracts from inflorescences of thistles Cirsium vulgare and Cirsium ehrenbergii, and there are few reports on their chemical composition. Objective: The aim is to obtain the hexane extract from inflorescences of both thistles and to identify preliminarily their main chemical component, and to evaluate the hepatoprotective properties of the extracts. Materials and Methods: Hexane extracts were obtained using a Soxhlet apparatus. The chemical composition was analyzed using infrared spectra and gas chromatography-mass spectrometry. Two doses (250 and 500 mg/kg, p.o.) of both extracts were administered to assess their hepatoprotective effect on acute carbon tetrachloride (TC)-induced liver damage in rats using biochemical markers of necrosis, cholestasis, functionality, oxidative stress, and histological analysis. Results: Extracts were shown to have a very similar chemical profile. Their major constituent seems to be lupeol acetate. The two doses of both extracts demonstrated comparable hepatoprotective properties because they significantly diminished all the liver injury indicators (P < 0.05) and were corroborated using histopathology. Conclusion: This is the first study on the hepatoprotective effects of nonpolar extracts from inflorescences of thistles C. vulgare and C. ehrenbergii. Hexane extracts administration totally prevented the acute TC-induced liver damage. The preliminary chemical analysis strongly suggests the lupeol acetate as their major constituent. Lupeol and its derivatives have been previously reported as antiinflammatory and hepatoprotective agents. Abbreviations used: TC: Carbon tetrachloride; FT-IR: Fourier transform Infrared spectroscopy; GC-MS: Gas chromatography – Mass spectrometry; V: Vehicle; E: Extract; Ecv: Extract of Cirsium vulgare; Ece: Extract of Cirsium ehrenbergii; AP: Alkaline phosphatase; GGTP: γ-Glutamyl transpeptidase; ALT: Alanine aminotransferase; DB: Direct bilirubin; TB: Total bilirubin; LP: Lipid peroxidation; MDA: Malondialdehyde; NO: Nitric oxide; TNF-α: Tumor necrosis factor-α. Background: The aim of this study was to investigate the in vitro antioxidant activity of Satureja macrostema (Moc. and Sessé ex Benth.) Briq. (Lamiaceae) essential oil, a Mexican medicinal plant known as nurite. Materials and Methods: Fresh aerial parts of S. macrostema plants cultivated in greenhouse for 3 months were subjected to hydrodistillation in a Clevenger apparatus to obtain essential oil. Volatile compounds were identified by gas chromatography (GC) and GC/mass spectrometry. 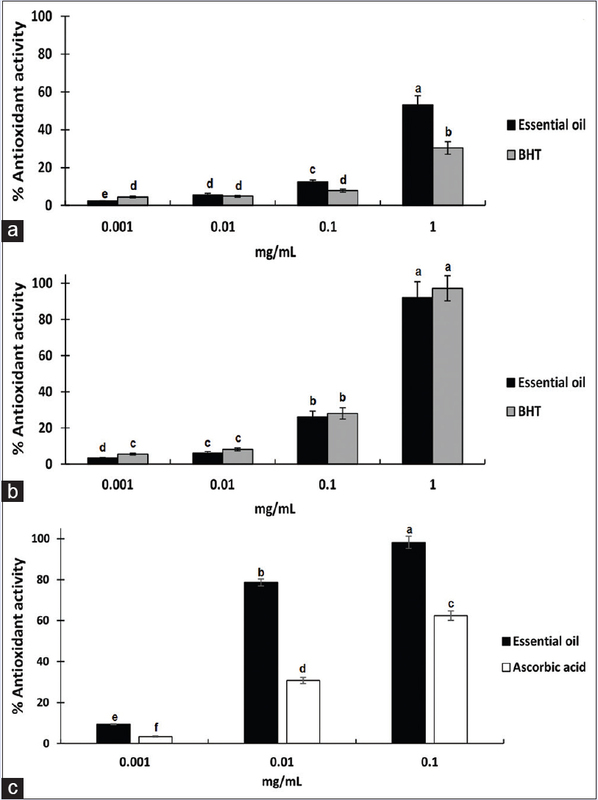 Antioxidant effectiveness of essential oil and its major terpenes of S. macrostema was examined by three different radical scavenging methods: 2,2-diphenyl-1-picrylhydrazyl (DPPH), 2,2'-azinobis-3-ethylbenzothiazoline-6-sulfonic acid (ABTS), and total antioxidant capacity (TAC). The concentrations tested were 0.001, 0.01, 0.1, and 1 mg/mL. Results: The major volatile compounds were caryophyllene, limonene, linalool, pulegone, menthone, and thymol. S. macrostema essential oil showed the highest free radical scavenging activity with DPPH and ABTS methods (53.10% and 92.12%, respectively) at 1 mg/mL and 98% with TAC method at 0.1 mg/mL. Thymol exerted the highest antioxidant capacity with 0.1 mg/mL, reaching 83.38%, 96.96%, and 98.57% by DPPH, ABTS, and TAC methods. 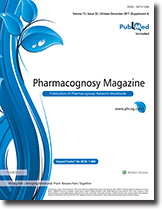 Caryophyllene, limonene, linalool, pulegone, and menthone exhibited an antioxidant capacity <25% with the DPPH and ABTS methods; however, limonene showed a TAC of 85.41% with 0.01 mg/mL. Conclusion: The essential oil of S. macrostema and thymol showed a free radical scavenging activity close to that of the synthetic butylated hydroxytoluene. Abbreviations used: GC: Gas Chromatography; DPPH: 2,2-diphenyl-1-picrylhydrazyl; ABTS: 2,2'-azino-bis-3-ethylbenzothiazoline-6-sulfonic acid; TAC: Total antioxidant capacity. Background: Coleus forskohlii is a well-known industrially important medicinal plant, for its high forskolin content. 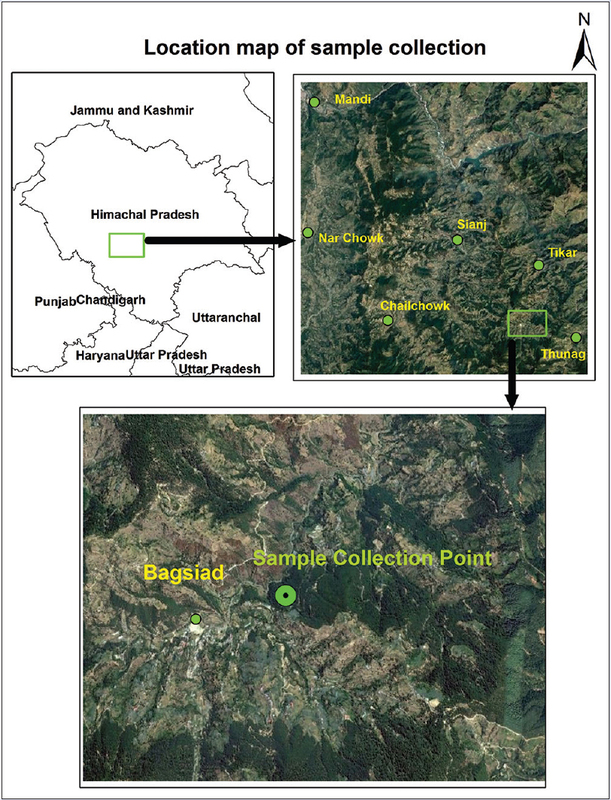 Objective: A simple, selective, and sensitive high-performance thin layer chromatography (HPTLC) method was developed and validated for simultaneous quantification of forskolin and iso-forskolin in C. forskohlii germplasm collected from the Eastern Ghats, India. Materials and Methods: Chromatographic separation of the targeted marker(s) was obtained on precoated silica plates using toluene: ethyl acetate: methanol (90:30:0.5, v/v/v) as the mobile phase. Results: Densitometric quantification of forskolin and iso-forskolin was carried out at 545 nm. 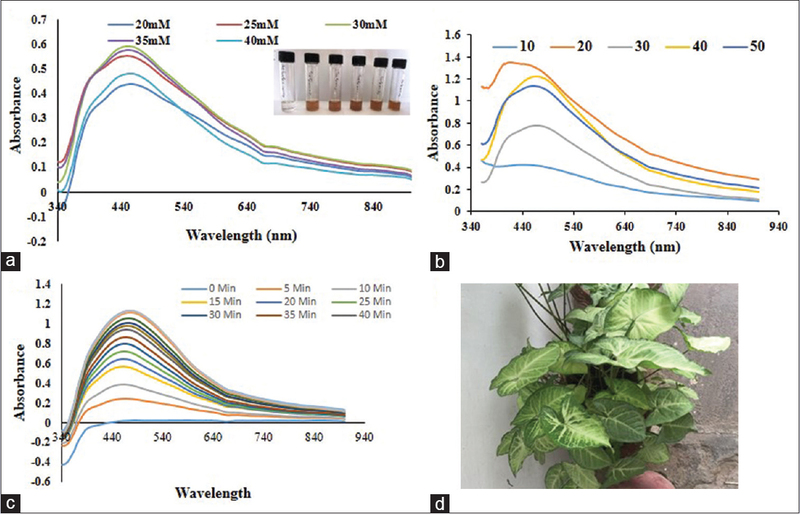 Forskolin and iso-forskolin were identified by comparing the ultraviolet spectra of standard and sample track at Rfof 0.64 ± 0.02 and 0.36 ± 0.01, after derivatization with anisaldehyde sulfuric acid reagent. The linearity of both the analytes was obtained in the range of 300–1200 ng/spot with the regression coefficient (R2) of 0.991 and 0.986. Recovery of analyte (s) at three levels, namely, 100, 150, and 200 ng/spot was found to be 100.46% ± 0.29%, 99.64% ± 0.33%, 100.02% ± 0.76% and 99.76% ± 0.62%, 99.56% ± 0.35%, 100.02% ± 0.22%, respectively, for forskolin and iso-forskolin. 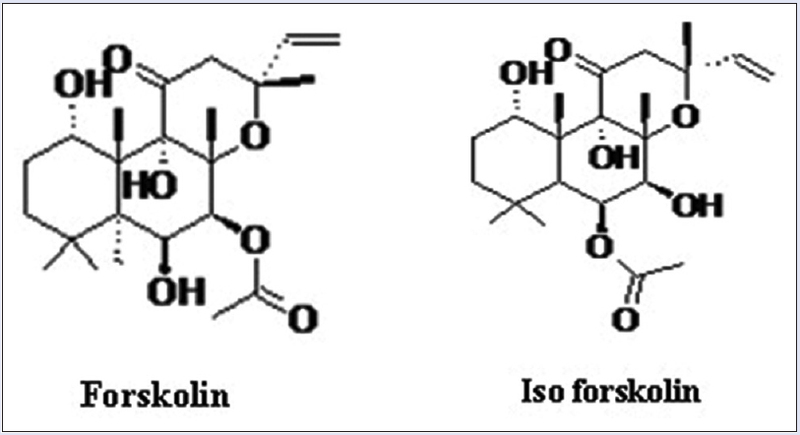 The content of forskolin and iso-forskolin varies from 0.046% to 0.187% and 0.002% to 0.077%, respectively (dry weight basis), the maximum content of both the markers was found in NBC-31, from Thakurwada, Maharashtra. Conclusion: The developed HPTLC method was linear, accurate, and reliable as per the International Council for Harmonisation of Technical Requirements for Registration of Pharmaceuticals for Human Use guidelines. The study aids in the identification of elite chemotype for commercial prospection of industrially viable medicinal crop. Background: The production of triterpenes from plants for pharmacological purposes varies in concentration, due to genetic and environmental factors. In vitro culture enables the control and increase of these bioactive molecules. Objective: To evaluate the effect of plant growth regulators and elicitors in the induction of calli and the production of ursolic acid (UA) and oleanolic acid (OA) in Lepechinia caulescens. Materials and Methods: Leaf explants were exposed for the induction of calli at different concentrations and combinations of 2,4-dichlorophenoxyacetic acid (2,4-D) and 6-benzylaminopurine (BAP). Methyl jasmonate (MJ) and salicylic acid were used as elicitors. 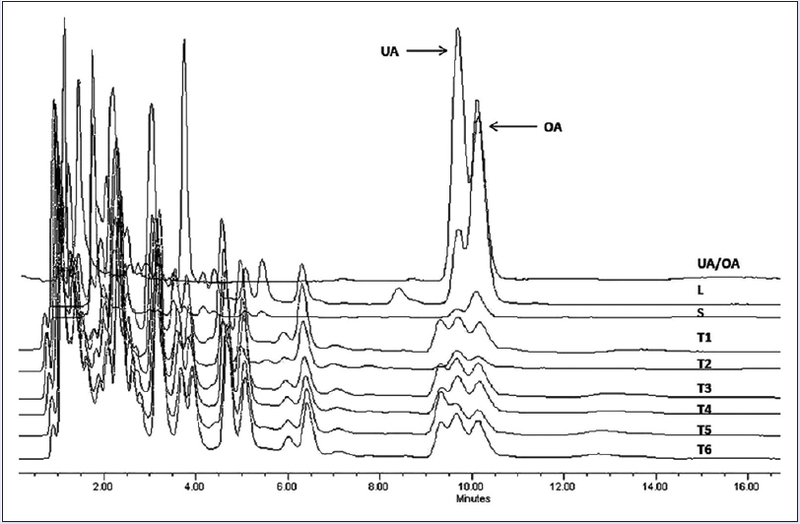 High-performance liquid chromatography method was used to quantify UA and OA content in each treatment. Results: Treatment with 3.0 mg/L of 2,4-D and 0.1 mg/L of BAP produced the best results for calli induction and production of UA (1.57 mg/g dry weight [DW]) and OA (1.13 mg/g DW). Both elicitors facilitated the accumulation of triterpenes. Conclusion: The combination of auxins and cytokinins showed favorable results for the induction of calli. Variation concerning the accumulation of UA and OA was observed between treatments. MJ increased the production of triterpenes five times after 8 h of exposure, compared to control treatment. There is a greater accumulation of UA (16.58 mg/g DW) and OA (1.94 mg/g DW) in leaves of wild plants. Abbreviations used: 2,4-D: 2,4-dichlorophenoxyacetic acid, BAP: 6-benzylaminopurine, DW: Dry weight, MJ: Methyl jasmonate, OA: Oleanolic acid, PGRs: Plant growth regulators, UA: Ursolic acid, SA: Salicylic acid. Background: Asparagus adscendens Roxb. (Asparagaceae), is native to the Himalayas. This plant has been used in the prevention and effective treatment of various forms of cancers. Objective: This paper reports, for the first time, on the cytotoxicity of the methanol (MeOH) extract of the roots of A. adscendens and its solid-phase extraction (SPE) fractions against four human carcinoma cell lines and LC-ESI-QTOF-MS analysis of the SPE fractions. 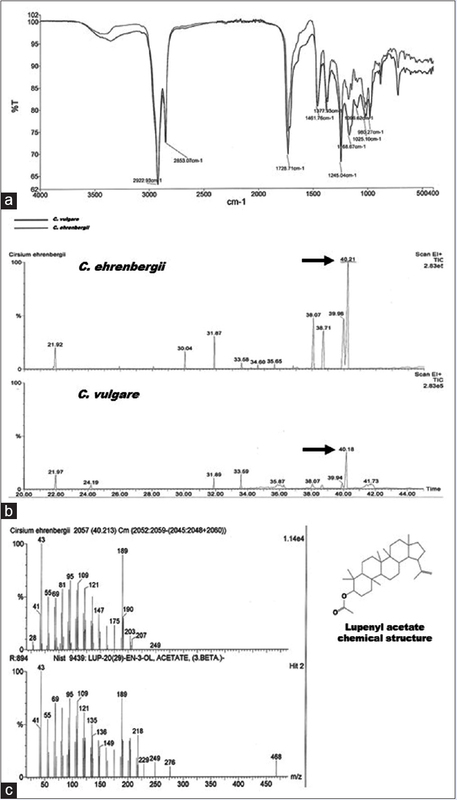 Materials and Methods: Finely powdered roots of A. adscendens were macerated in methanol and extracted through SPE using gradient solvent system (water: methanol) proceeded for analysis on LC-ESI-QTOF-MS and cytotoxicity against four human carcinoma cell lines: breast (MCF7), liver (HEPG2), lung (A549), and urinary bladder (EJ138), using the 3-(4,5-dimethylthiazol-2-yl)-2,5-diphenyltetrazoliumbromide assay. 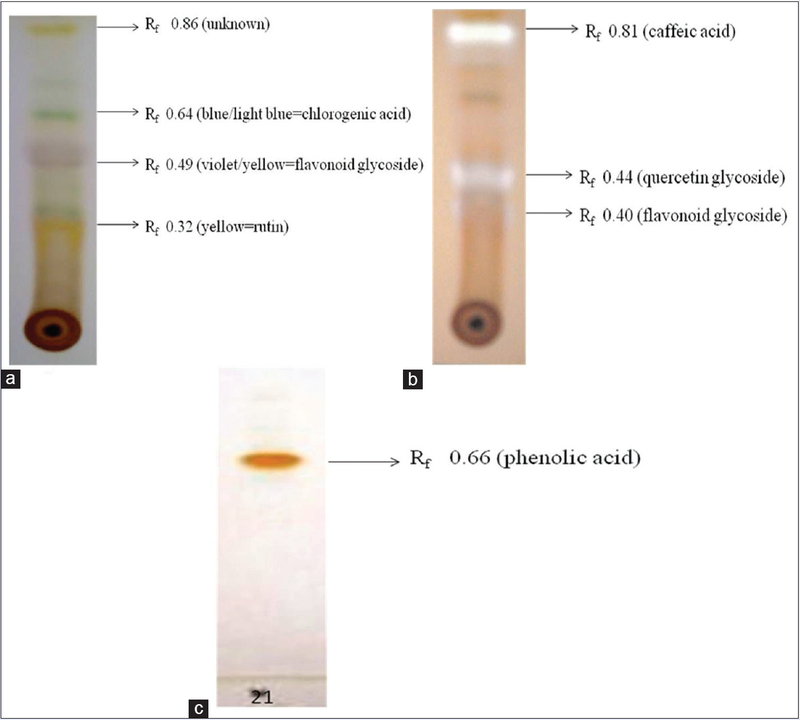 Results: The MeOH extract and four SPE fractions exhibited cytotoxicity against all cell lines with the IC50values ranging from 6 to 79 μg/mL. As observed in other Asparagus species, the presence of saponins and sapogenins in the SPE fractions was evident in the liquid chromatography-mass spectrometry data. Conclusion: It is reasonable to assume that the cytotoxicity of the MeOH extract of the roots of A. adscendens and its SPE fractions, at least partly, due to the presence of saponins and their aglycones. 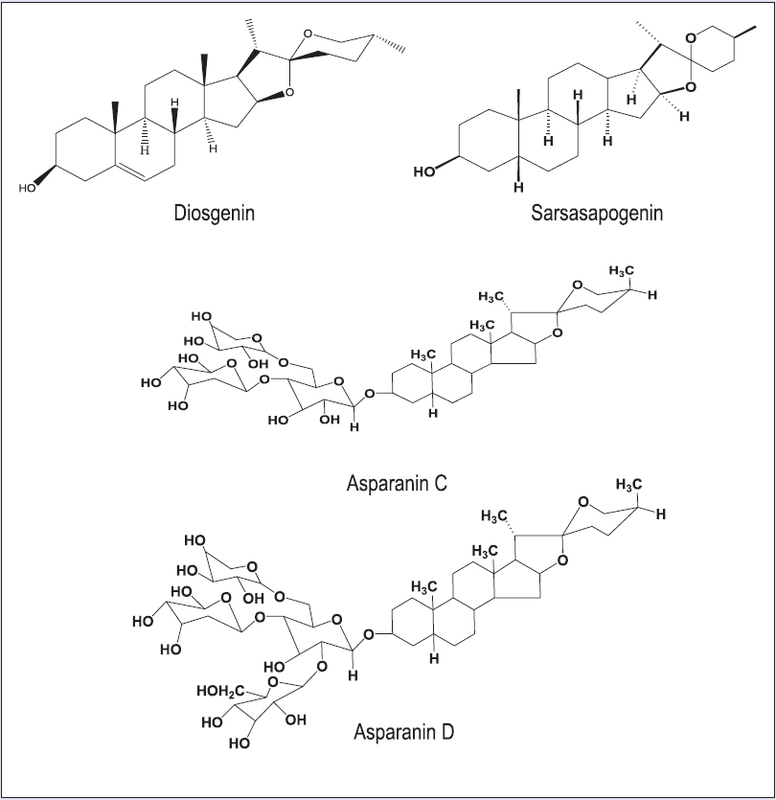 This suggests that A. adscendens could be exploited as a potential source of cytotoxic compounds with putative anticancer potential. Abbreviation used: SPE: Solid-phase extraction, MCF7: Breast cancer cell line, HEPG2: Liver cancer cell line, A549: Lung liver cancer cell line, EJ138: Urinary bladder cancer cell line, MTT: 3-(4,5-dimethylthiazol-2-yl)-2,5-diphenyltetrazoliumbromide, LC-MS: Liquid chromatography-mass spectrometry. Background: Quercetin (QR) and thymoquinone (TQ) are herbal remedies that are currently extensively used by the general population to prevent and treat various chronic conditions. Therefore, investigating the potential of pharmacokinetic interactions caused by the concomitant use of these herbal remedies and conventional medicine is warranted to ensure patient safety. Purpose of the Study: This study was conducted to determine the inhibitory effect of QR and TQ, two commonly used remedies, on the activities of selected cytochrome P450 (CYP) enzymes that play an important role in drug metabolism and/or toxicology. Materials and Methods: The in vitro studies were conducted using fluorescence-based high throughput assays using human c-DNA baculovirus expressed CYP enzymes. For measuring CYP2E1 activity, a validated High-performance liquid chromatography (HPLC) assay was utilized to measure the formation of 6-hydroxychlorzoxazone. Results: The obtained half-maximum inhibitory concentration values with known positive control inhibitors of this study were comparable to the published values indicating accurate experimental techniques. Although QR did not show any significant effect on CYP1A2 and CYP2E1, it exhibited a strong inhibitory effect against CYP2D6 and a moderate effect against CYP2C19 and CYP3A4. On the other hand, TQ demonstrated a strong and a moderate inhibitory effect against CYP3A4 and CYP2C19, respectively. Conclusions: The findings of this study may indicate that consumption of QR or TQ, in the form of food or dietary supplements, with drugs that are metabolized by CYP2C19, CYP2D6, or CYP3A4 may cause significant herb-drug interactions. Abbreviations used: ABT: Aminobenztriazole, BZF: 7,8 Benzoflavone, CYP: Cytochrome P450, GB: Gingko Biloba, IC50: Half-maximum inhibitory concentration, KTZ: Ketoconazole, QND: Quinidine, QR: Quercetin, TCP: Tranylcypromine, TQ: Thymoquinone.